Hoppo Bumpo: Melbournian ... or Goth? This week I decided to have a little try at creating my own skirt pattern. For some while now I'd been thinking it would be nice to make a yoked skirt in a nice drapey stretch fabric. I figured that with my sway-back and mahoosive bottom, that a yoke line might look quite flattering. Never underestimate the powerful trick of chopping one's derriere in half (er, horizontally as opposed to the natural vertical division). After sketching the pattern onto paper (using several existing garments for inspiration), I checked the stash for suitable fabric. I rummaged through the stretchies. There was black jersey. Black bengaline. Black ponti di roma. Black interlock. Not to mention several lengths of black jersey. Um, should I choose the black ... or the black? Suddenly it occurred to me. Despite being the most unfashionable person I know, maybe I really am a slave to Melbourne fashion: head-to-toe black. Either that ... or I am a latent Goth. Perhaps I will stick with Goth. Yes. Forget the yoke: the next skirt can have a jolly big Victorian bustle. No-one will know whether I have a mahoosive bottom or not. I don't think it's goth, at all. 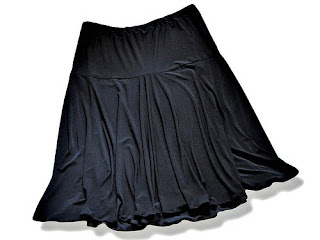 I think it's just a nice black skirt. CAN NOT WAIT FOR BUSTLE !